Edwina Tops-Alexander (AUS) reigned victorious at the Longines Global Champions Tour of Grand Prix of Miami Beach triggering the prospect of a thrilling contest with current ranking leader Scott Brash (GBR) for a record third championship title. Speaking after her victory lap of honour Edwina said it was “amazing” to have qualified for the Longines Global Champions Super Grand Prix at the new GC Prague Play Offs in December. With a hefty contest shaping up between Tops-Alexander and Brash, at this early stage of the LGCT season, she admitted: “I know the two of us are going to be at it again to win." Both hugely talented Olympians have won the sought-after individual LGCT Championship title twice already and, if either rider can triumph at this season’s finale, they will make history as the first to accomplish the feat three times. The overall LGCT Ranking battle is already an intense affair, with Brash (GBR) leading the charge for the 2018 season. 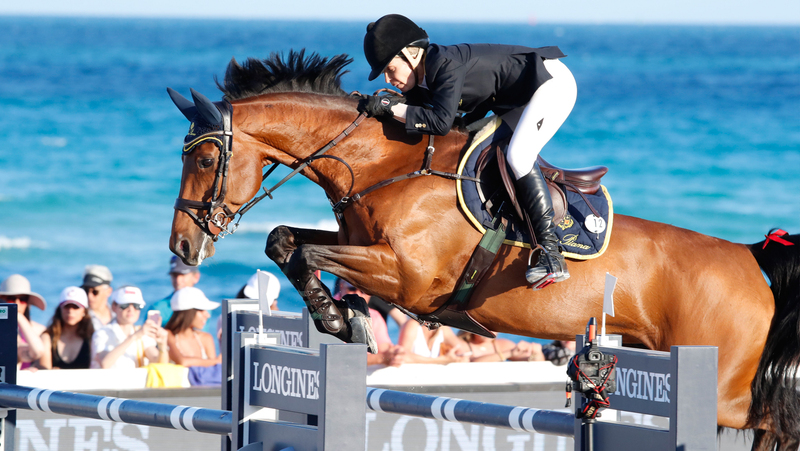 Tops-Alexander is the second rider — after Mexico City Grand Prix winner Brash — to qualify for the Longines Global Champons Super Grand Prix which will take place at the GC Prague Play Offs this December. As the sun set on the show’s final day on the magnificent Miami Beach setting, Tops-Alexander once again stepped up to the top of the podium in the balmy evening — repeating her feat from 2016, when she won on Lintea Tequila. Competing on her gutsy 11-year-old Dutch mare, California, she snatched glory as the final combination to jump in today’s LGCT Grand Prix of Miami Beach, edging out Qatar’s Bassem Mohammed, the only other rider who pulled off a double clear. Ireland’s Darragh Kenny rounded out the podium after an unlucky fence down with Cassini Z.
Michael Bloomberg was among guests at the event and watched his daughter Georgina compete with her team New York Empire in the GCL showdown in Miami Beach. The billionaire businessman and former New York Mayor said of the Longines Global Champions Tour and GCL event: “This is such a spectacular location. It is good for the sport and great for all the people who come here, the aficionados and the tourists who can walk by and watch. I am always interested to come and see my daughter, it’s is great she’s riding." All the riders at the show — even those who came out with more faults than they would have liked — praised Uliano Vezzani’s technical and intricate course-designing. They were light and delicate, meaning that the smallest of mistakes influenced the outcome, but also not gigantic, intimidating fences, so even horses making mistakes did not have their confidence dented. Still, with the proximity of the sea and the crowds, the venue has the feel and intensity of an indoor show — just without a roof. Five riders (all from different nations) from the 35 starters pulled off first-round clears to qualify for the jump-off, with the final two fences hard up along the shoreline side of the arena and towards the in-gate proving particularly influential. Final-fence faults meant many riders’ jump-off hopes were dashed at the last minute amid groans from the packed out crowds watching. Belgium’s Pieter Devos had the tricky task of tackling the seven-jump second round first, and emerged with an unlucky four faults on Claire Z after the lightest of rubs on the first element of the double sent the poll skittering out of its shallow cups. Spain’s Eduardo Alvarez Aznar was next out, but his tactic of a slow clear was scuppered when 13-year-old Fidux simply didn’t get high enough in the air over the penultimate obstacle. One more four-fault round followed him when Darragh Kenny’s mount Cassini Z punched out the front rail of the final spread. But his time was better and, with two left to jump, he had secured a podium position. The ever-consistent Bassem Mohammed and 12-year-old Gunder put in the first clear of the jump-off, making absolutely sure every rail stayed up. It was a cautious, tactically ridden round that did the job and put him at the head of affairs with only one rider left to jump. But it wasn’t pedal to the metal — and that one rider was the formidable Tops-Alexander, who had the advantage of complete intel about the course as the last to jump. Her round on the 11-year-old Esprit mare California shaved more than three seconds off Mohammed’s time, handing her victory and the lion’s share of the class’s €300,000 prize-fund. This class concluded action at the Miami Beach leg of the Longines Global Champions Tour. The next edition takes place in Shanghai (28-30 April) and will be live-streamed via GC TV as the world’s best head to Asia’s Tour destination.